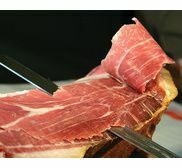 The Kintoa ham is made according to an ancestral method, known and transmited through generations by the Basque farmers. 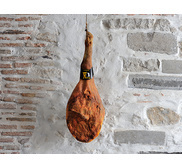 Salted with a dry salt coming from "Bassin de l'Adour", it is cured in our natural drying shed for 17 months minimum. 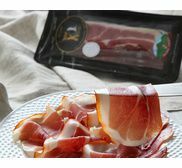 The breed of the pig (Iberian pig)along with the free-range breeding and the long curation, give to this Kintoa ham its marbled meat, fruity flavor and deep and strong taste. Silver medal in "Concours Général Agricole Paris 2012"
Gold medal in "Concours Général Agricole Paris 2011"